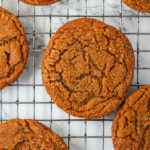 These soft and chewy cookies are sweetened with molasses and brown sugar and spiced with ginger, cloves, and cinnamon. 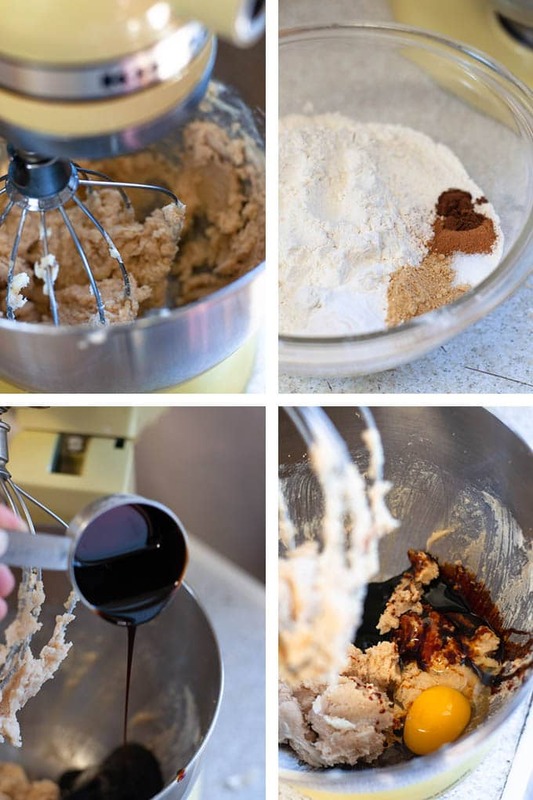 This is a must-make Christmas cookie recipe! 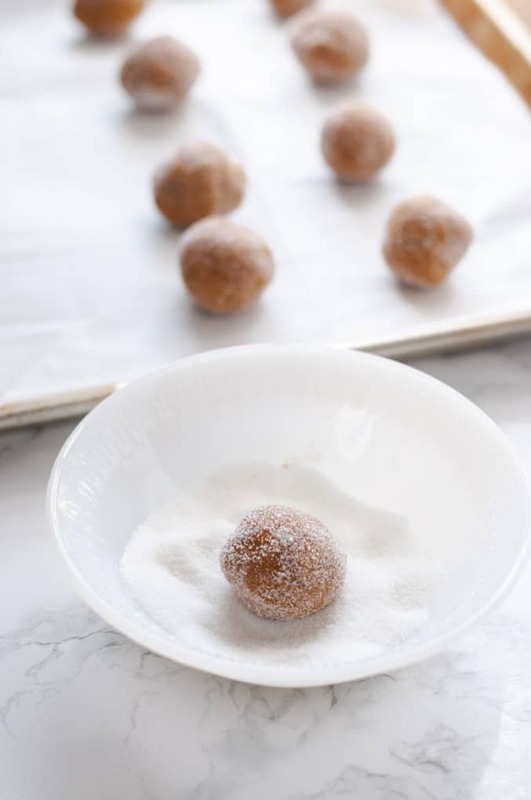 December isn’t complete without sharing the recipe for these molasses crinkles. In the spirit of the Christmas season, I’ve been sharing recipes inspired by classic family recipes, like my Easy Vegetarian Breakfast Casserole and Vegan Cinnamon Rolls. 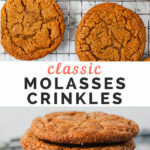 It’s only natural that molasses crinkles are next up in this nostalgic recipe series. Cookies were a constant in my childhood. Every week or two my mom made a fresh batch, varying between chocolate chip, oatmeal chocolate chip, and chocolate-chocolate chip. But when Christmas came around she kicked it up a notch: sugar cookies (of course), powdered sugar coated chocolate crackles and, of course, molasses crinkles. A favorite cookie for each kid (mine was, and still is, the chocolate crackles). 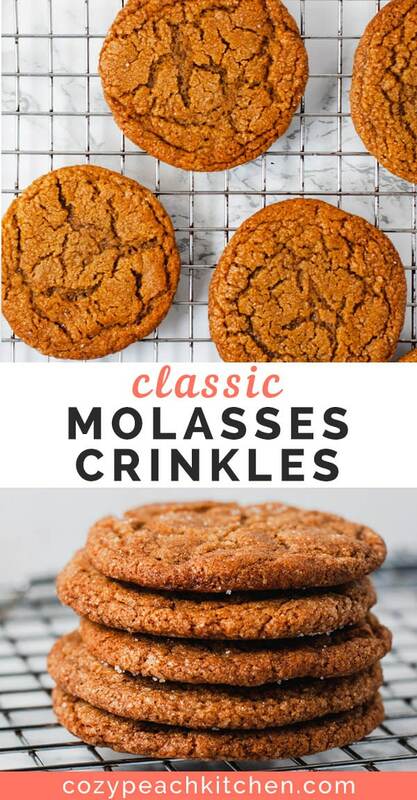 I didn’t learn to respect the molasses crinkle until my late teen years, because if it wasn’t a cookie made with pure chocolate or straight sugar I wasn’t interested. 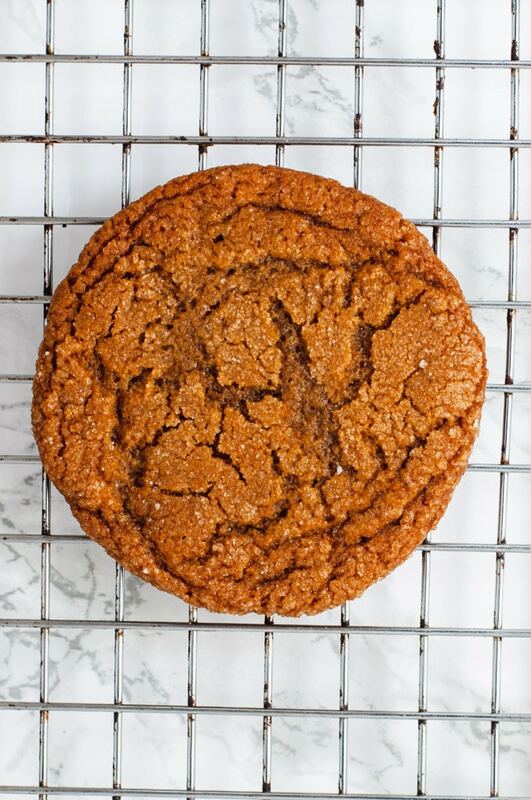 And molasses crinkles are anything but your standard homemade cookie. 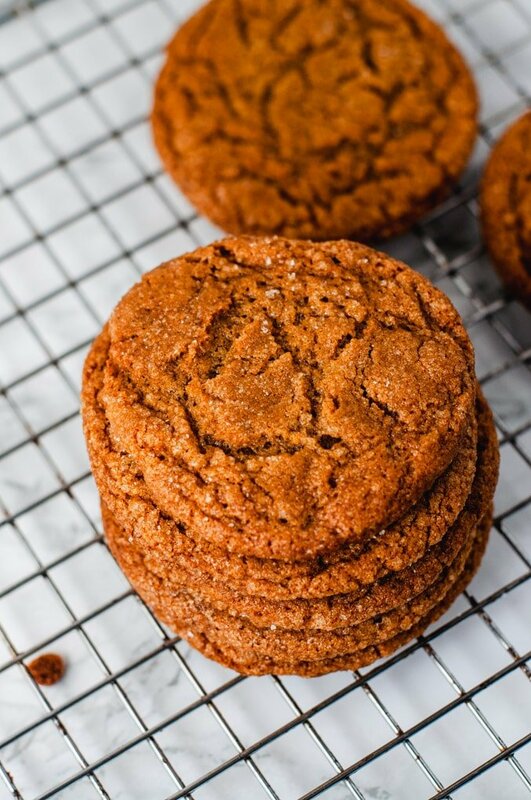 Molasses crinkles are sweetened with brown sugar and molasses and spiced with cloves, cinnamon and ginger. They’re chilled before baking, then rolled in granulated sugar, giving them their classic sugar-coated cracked look, or “crinkle” look. In a few words: they’re rich and delicious, and anything but your classic cookie. This is almost the exact same recipe that I grew up with. Many of the traditional recipes in my family come from old Church-made Mennonite cookbooks; this specific recipe is from a 1980 edition that has been well used and loved. The only difference between the recipes is that I use butter instead of margarine and the cookies are baked at 350F, whereas the original recipe calls for 375F. Either way, these cookies taste just as good today in 2018 as I’m sure they did when my grandparents’ fellow church-goers enjoyed them in the 80s. 1. Start by creaming together room temperature butter and brown sugar. 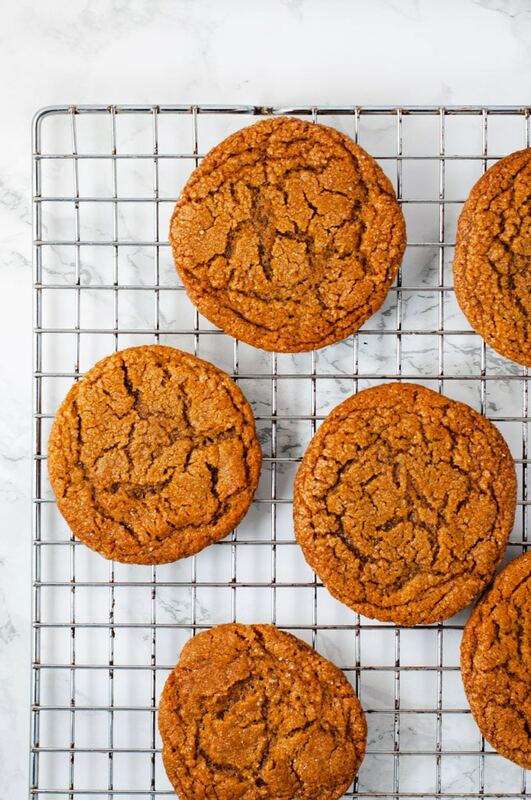 Brown sugar gives these cookies a rich, more caramel flavor than granulated sugar would. It also contributes to the golden brown color of the molasses crinkles. 2. Mix in molasses and one egg; it’s best if your egg is also room temperature. 3. Stir together the dry ingredients in a separate bowl. 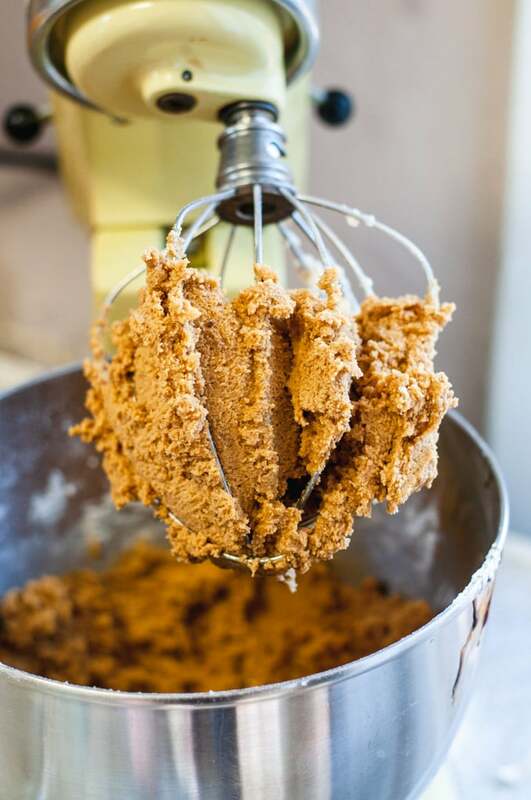 Slowly mix in the dry ingredients using a wooden spoon so as not to overmix the dough. 4. Chill for an hour before baking. Roll into 2″ balls and coat in granulated sugar. 5. Bake in a preheated 350 degree oven for 11-13 minutes, until the edges are set and browning. The result? A moist, soft and chewy cookie that tastes like Christmas. Looking for more Christmas sweets? 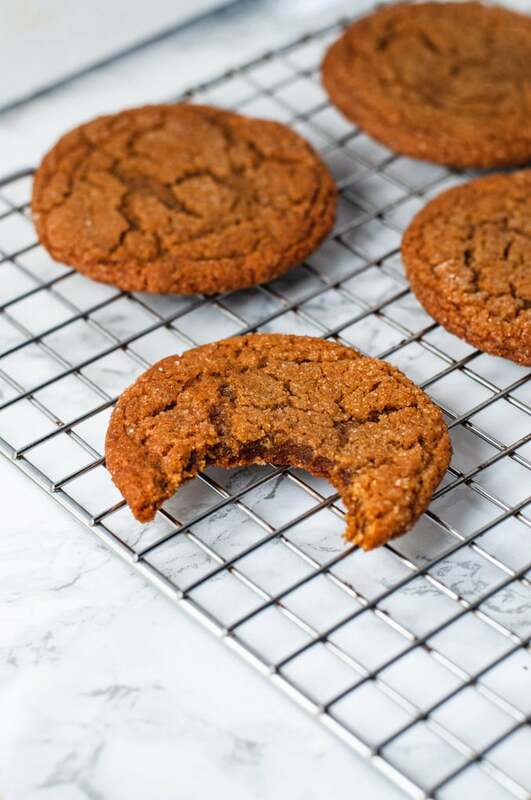 This Vegan Gingerbread Loaf is another molasses-sweetened treat, and these Dark Chocolate Peanut Butter Cookies are inspired by another favorite family recipe. 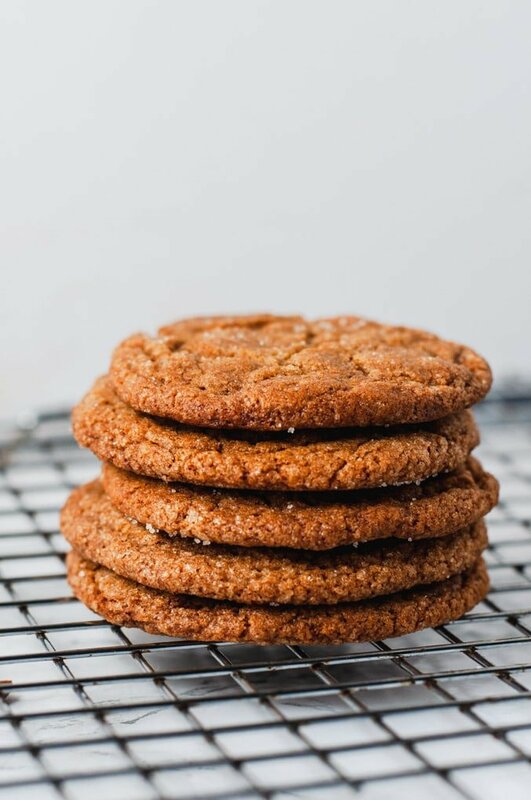 Soft and chewy cookies sweetened with brown sugar and molasses and spiced with cinnamon, ginger and cloves. Cream butter and brown sugar until light and fluffy. Add egg and molasses, mixing well. Combine dry ingredients in a separate bowl: flour, baking soda, spices and salt. Add to creamed mixture a little bit at a time. Mix well. Chill for at least 1 hour and up to 24 hours. Preheat oven to 350 degrees F.
Shape dough into balls and roll in granulated sugar. Place on parchment paper lined cookie sheet 3 inches apart. Bake for 11-13 minutes. Immediately remove from baking sheets to cool.